Give an ordinary brown rice side dish a MAJOR, mouth-watering makeover with this Mexican Style Corn and Rice Casserole Recipe. Oh how I love easy casseroles that taste AMAZING and require very little effort. This delicious, low calorie casserole recipe was a huge hit at my house, and it was so easy to put together. 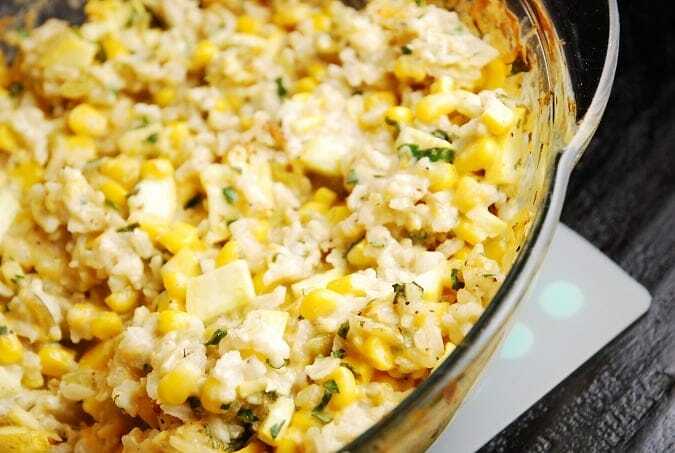 It’s brown rice, with corn and squash, smothered in a sour cream, chile and cheese sauce. YUM. I spiced it up a bit with jalapenos, but you can omit that if you’d prefer a more mild version. Each serving is 7 Points, and is very satisfying. Serve this with some grilled chicken or fish, and a salad, for a balanced meal. I’m going to try experimenting with this recipe a bit more, and make it without the corn, adding in some other low carb vegetables instead, in order to lower the Points value. The corn is delicious though, and well worth the Points, if you have them to spend. This Weight Watchers Casserole Recipe that truly feels like a decadent comfort food. Prepare rice according to package direction, using broth instead of water. Preheat oven to 350, and lightly spray a 1 ½ qt baking dish with non-fat cooking spray. When rice is ready, combine with all remaining ingredients, and place in oven, uncovered for about 30 minutes. Could you make this with riced cauliflower instead of brown rice? I haven’t tried it yet, but sounds like a great idea!! If you make it, come back and let us know how it turns out! Does the recipe call for an additional 2 cups of broth after you cook the rice in broth? No…it’s just to use when cooking the rice. Sorry for the confusion! I used a bag of Kroger’s private select southwestern mix frozen corn with black beans and peppers, so yummy! I did still have to had a little extra plain yellow corn because I didn’t think there was enough in the southwest mix for my personal taste. I was wondering if you’ve gotten a chance to try this recipe with something other than corn. And if so, what your results were. It looks so yummy, but I’ve found over the years I can’t tolerate corn all that well and I try to avoid it. This recipe still caught my eye and I just had to take a moment to ask. Thanks! I really liked this recipe. I added some finely diced onion, about half a small onion, and a tablespoon minced garlic. It was really good! I served it with a chili lime grilled chicken and everyone loved it!